Some moments in child care take everything you’ve learned up until that moment. It sometimes feels like the culmination of my whole life as a daughter, sister, mother, master’s degree student, teacher, and therapist. The last of which I’m not, but often find myself having to be with the demands of the job. This week’s moment was with my brother and sister pair. They are typical siblings with the usual squabbles who band together rabidly if anyone else bothers them (she’s MY sister – only I can beat the crap out of her!). This time it was brother who took the blow. I missed the beginning of the fight but saw and heard the outcome. He hit the deck, hard. Full-on WWE body slam. I walked into the room and all eyes were on me. I had a lot of choices as to how to handle this situation. I could yell and make a big scene, I could punish her, I could try to set an example for all the kids by showing everybody how wrong this was, and how angry it made me. Sister was too afraid to even say she was sorry. She was staring at me waiting for the hammer to come down. I looked at brother. He was laying on the floor, pained not only because he’d whacked his head pretty good, but I could see it in his eyes: How could she do this to me? My heart melted. I didn’t say a word to anybody. I went to him, knelt down, pulled him into my lap, and just sat and hugged him in silence. No one knew what to do. They spoke a few words here and there but were at a loss as to what I was thinking. I looked around at the kids and realized they were all playing their roles. Sister knew she was in trouble and was trying to blend into the background while knowing she still had to atone for it. The other instigator of the fight knew this was big, but was thinking I didn’t know she had anything to do with it and she might get off scot free. My class clown started being funny to try to distract everybody from the tension. But I wasn’t going to move on without addressing the moment. As I sat and held brother I took a moment to collect my thoughts and decide how I was going to handle this. It was good to let the kids stew for a moment, worrying about how much trouble this was going to be. And it’s good for me not to have to make snap decisions all the time. Sibling fighting is a ploy for attention, and sometimes when you give the right attention the fight is resolved (doesn’t mean there won’t be another one). I remembered raising my own boys and being so angry at one when he’d hurt the other. It didn’t matter who was the perpetrator or what they did – when one of my babies was hurt, mama bear roared. It was unacceptable to me – you do NOT hurt your brother! This is your FAMILY. That may be the one thing I fought them the hardest on, and I know I got it from my mother. My sister and I rarely had fights but when they did, they were a doozy. I didn’t necessarily want her to be punished – I just wanted someone to understand how I felt. My mother would spend a while talking with her in her room, then come to me. Usually we’d have to say sorry, but it didn’t feel so hard after we aired our feelings and got the attention we needed. In the end I just ignored everyone but brother and kept asking him how he felt. We talked about how hurt and scared he was. I asked why she pushed him down. He said he took her toy. I said, “Do you think taking her toy made her angry?” He nodded yes. Then I asked, “Do you think it’s fair to be tackled for taking a toy?” After that, sister approached and genuinely apologized to him. I don’t know how much it sank in – it certainly didn’t stop them from battling out the rest of the week. But for the moment, she really saw that what she’d done was wrong. Brother felt comforted, not because it came from me but most importantly, because it came from his sister. And at lunch time, when sister told me, “You always give me the food last,” I resisted the urge to tell her that those who try to destroy their brother will eventually pay the price. Oh. Something tells me I’m gonna love this. Or maybe not so much love, but watch helplessly, like a car crash. These parents must have known they were being filmed. Did they tone it down? Or tone it up? The clip is from the new HBO Sports documentary “State of Play: Trophy Kids” by the actor and director Peter Berg, who studies the insanity of parents who push their kids too hard in sports. Just looking at this short clip shows the ridiculous lengths people will go to, including teenagers with personal trainers and parents making their kids cry on purpose to “toughen her up.” I can’t imagine a parent seeing their child break down in tears, specifically caused by them, and not feel heartbroken. I’m amused by the mother who, blubbering through her own tears, says “What if I didn’t do everything I could to help them realize their dreams?” Here Berg gets right to the heart of crazy sports parents: it’s 100%, completely and totally vicarious. It is rarely, if ever, the kid’s dream. What my parents dreamed for themselves is certainly not what I dreamed for myself, as is the same for my kids. Luckily my parents realized that pretty early and let me find my own way. They supported the choices I made for the activities I wanted to do. I hope to be able to do the same for my kids, and so far I think I’ve done an OK job. In fact, it makes my skin crawl when people say I’m a soccer mom. Not just the stereotypical van-driving, coffee-drinking, hair-in-a-ponytail and sweats on because I ran out the door at 8AM on a Saturday to get to my kid’s game mom. Because, yeah, that is me. But I think of the stereotypical “soccer mom” as the woman in the movie. I am a soccer mom in that my kids play soccer. They’re good at it, and they love it, and for those reasons I love watching them play. But if I ever became that woman, or anyone thought of me as her, I think I would die of embarrassment. Not a soccer mom. 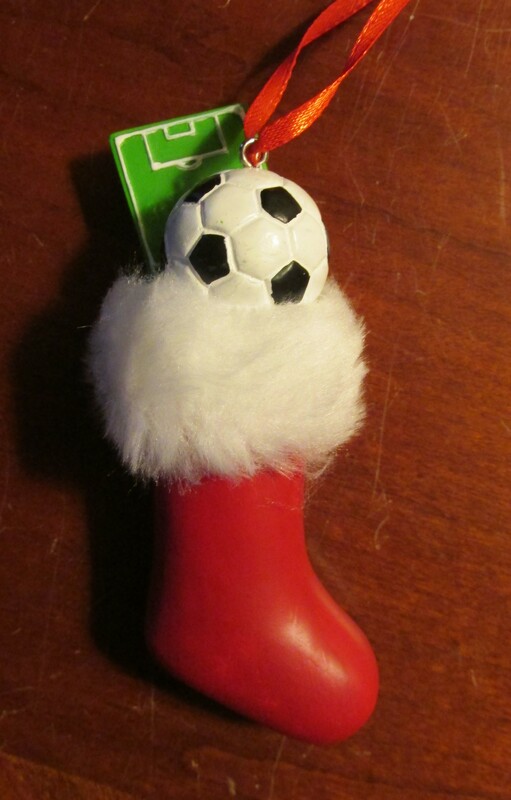 But this is the ornament the kids got me for Christmas. What it takes to become a professional athlete is a very unique and very rare combination of ability, skills, motivation, and desire. One can only be born with this set of attributes, and no parent can give them to their child just because they want them to succeed. The freak success stories of people like Tiger Woods and the Williams sisters make everyone believe they can turn their kids into stars. But those people happened to have the one-in-a-million lightning bolt combination to make it. It pains me to see the looks on the faces of the kids in that video. If someone else made those kids look that way, wouldn’t the parents rush to their defense? They are so hurt, ashamed, embarrassed – and any parent who thinks they can encourage their child to do better in sports using those tactics is just wrong. Here’s a new rule. Instead of forcing your kids to do the sports you think they should do, make sure they do at least one thing. Let them pick it out. It doesn’t have to be sports. When my son wanted to quit basketball it tore us up. But he found something else he loves and begs to go whenever we have a free moment. We had to let him find it himself and now we support him in this new path. Who knows how far this activity will take him? It could be something he does his whole life, and his love for it will be shared with others who love it. I doubt very much that the parents in that video would take this advice. They may be shocked when their kids end up resenting them and turning to all kinds of bad behavior because they’re so stressed. They may be shocked when the principal calls them in to say their kid is a bully (I haven’t even explored that avenue but where do you think they come from?). I hope to get a chance to watch it and see if anyone changes their ways, or what their response is after the video goes public. This is compelling and important work, and I thank Peter Berg for having the guts to make it. The news about children and violence has been grim lately. I’m tired of the daily grind of shootings and homicidal bullying. It feels like a sickness. The word tragic has even become rote in this game. We hear tragic every day and it becomes less tragic. After a teacher was killed protecting his students in Sparks, Nevada last week, the NRA yet again called for more guns in schools, going so far as to say that honor students should carry them. Their standard, cold-hearted, almost inhuman response to gun violence is to add more guns to the picture. Let’s put it this way: We don’t allow people to vote until they’re 18. Because until then, people don’t have the reasoning and decision-making skills to make a choice that affects others. If they can’t color in a bubble next to someone’s name, they can’t have a gun. Period. I don’t feel shock anymore. I feel angry. It’s time for parents to step up. Stop blaming video games and movies and all the things you ALLOW your child to be exposed to for hours and hours for their bad behavior. The things, in fact, that you’ve sought out to babysit your kids while you spend your time doing whatever it is that’s more important than being with them. The way your children treat others is taught first and foremost by you. Don’t look to the schools or teachers or their friends or coaches to teach them how to be a good person. Do it yourself. Last week my son showed me an article in his Scholastic News (elementary school flashbacks) about a town in Wisconsin that is fining the parents of bullies. I was tickled that he wanted to show it to me, rather than being sick to death of hearing me talk about the subject. It was a great conversation and I was happy to hear his viewpoints. But most interesting was our conclusion: it’s a step in the right direction, but it’s not enough. Get help. Just because you had a kid doesn’t make you a parenting expert. It only makes you one of a million other people who had kids and don’t know what the hell they’re doing. Who are now faced with hundreds of decisions every day that seem to have lasting consequences reaching into the future and the good of your child. It’s overwhelming and stressful. When we’re physically sick, we go to the doctor. It’s time for us to realize that we are mentally sick too, and get some help. I don’t care if it’s a guidance counselor, therapist, teacher, child care provider, anyone you trust. Just get help. I spend all day every day teaching kids how to communicate with each other and how to understand what the others want. Compassion, empathy, remorse. The basic things we need to function with other people. The other day my little guy – 21 months old – bit someone after a fight over a toy. I used my usual tactics to handle the situation and while I was still tending to the girl he bit, he walked over of his own accord, put his hand on her shoulder, and said, “Sorry Janie.” She turned around and hugged him. Astounding. And utterly possible. That’s less than two years old, folks. If a toddler gets it, the rest of us should be able to. One of the hardest things I had to get used to when I opened my day care was slowing down to kid speed. I mean, really slowing down. While taking care of little ones you can get in a rush pretty easily. But trying to get three toddlers down the front steps without falling and scraping their noses on the pavement can be an excellent exercise in taking one’s time. Adults are always in a rush. Our heads are always in two (or more) places at once. We have pressures and stress and things to do and events to plan and people to care for and the news and our jobs, and all that noise in our heads makes it very difficult for us to actually be where we are. For instance, the other day Mr. E saw the fan icon on the microwave, which spins, and said, “Wheel.” (The boy loves wheels.) From his perspective, that’s totally a wheel. And yesterday one of my girls gave me a colorful fall leaf. We looked at how pretty it was, then I absentmindedly started spinning it between my thumb and finger. This was like a whole new world of awesome. She stared at it for minutes while we both got a little entranced at the sight. So I’ve found that one of the key aspects of successfully working with kids is seeing what they see. It takes practice, training, and an awareness of everything that’s going on around you. I have to know where everyone is, what they’re up to, and who’s playing with what toy, in case someone comes up and grabs it out of their hands. I started a new, young group last month and my head was spinning. I was going in ten directions at once, barely keeping up, something always needing to be done and someone always needing my attention. I felt pulled in all directions and wasn’t sure I could keep up the pace. Then I got sick. I thought I was doomed for sure. If I can’t keep up top speed, this ship is sinking. But here’s the weird thing: when you’re sick, you slow down. My head hurt so much I couldn’t run around, so I just sat, and the kids came to me. They each got a little fix of my attention in turn, and then they were happy to go off and play. Instead of being on my feet and missing something, I could watch all that was happening and help them move through the day so much easier. There wasn’t as much attention-seeking behavior (which is our nice professional way of saying “bad”) because I was connected with them much more consistently. Another trick I used is listening to everyone’s side and not having to “punish.” I have an infant now and while I’m busy feeding or changing her, plenty of other stuff is going on with my wild bunch. An adult may look at a situation and think, this child needs a punishment. When actually the other kid – as long as they get their toy back – could care less. Children mostly just want to be heard. If I can listen sympathetically to both kids and name their feelings for them, they’re satisfied. By the time they’re done talking to me about what happened, they’ve moved on to the next thing and forgotten about what caused the hurt in the first place. This doesn’t excuse all behavior but it saves a lot of hurt feelings on both sides of a fight. Sometimes being heard is more important than seeing a friend get in trouble. Another great technique I’ve fallen back on recently is broadcasting. While I’m under that baby (or suffering from a sinus headache) and watching what the kids are doing, I repeat it back to them. “Mr. O’s mowing my lawn – awesome! I needed that done. Wow Ms. G, that was a big jump.” When you verbally connect with the kids – even if they don’t respond or even seem to notice – they know you’re present and you care about them. They eat it up. I feel better now, but I’m consciously keeping a much slower pace. I’m spending as much time as I can not rushing, not moving around. Sitting right down on the floor in the middle of the kids and observing. Being calmer and less agitated by all the things I have to get done, and finding that some of them I don’t really have to do. Maybe just keeping the peace is the most important one. I’m starting a new two-year-old girl in my child care, Ms. A. She is adorable, and curious, and very excited to explore her new surroundings. But she does not like to take a nap. The first day we spent together, she climbed out of her pack-n-play about 57 times. I lost count but I’m pretty sure it was around that much. I felt like I was in a SuperNanny episode (and so glad I could use her sleep technique). The second day, she climbed out three times. Then she rolled around in her bed for about an hour, alternating between whining, yelling, a little crying (not serious), and giving me dirty looks but trying not to let me know she was doing so. All I could do was chuckle. Not to make light of her desperation, but it was just funny to me. I forget after doing this work for eleven years that this kind of talk can be upsetting to parents. I know hearing “I don’t like you” from your child can hurt. But it’s your response that matters, not what your child said. It’s not really that they don’t like you. Really?! Don’t fall for it. In truth, they feel safe enough with you to say that and trust that there won’t be dire consequences. They’re simply testing the boundaries. Throwing a rock in a pond to see what kind of splash they’ll get. And they’re just venting! Don’t you say stupid things to your family and friends when you’re angry? Ms. A knew she wasn’t getting out of the crib any other way, and she was trying her last resort to get a rise out of me. I didn’t respond. I continued to sit and read the newspaper, which I’d been doing nearby enough for her to know I wasn’t gone, but also that if she climbed out I was right there to put a stop to it. As I told her mom, we made great strides! In one day, going from a full hour of jumping out of the crib to stopping after three attempts – that’s amazing! We might even see sleep in the next couple of tries. This is real progress. When your child says, “I don’t like you,” they’re looking for your attention. Kids will take negative attention if it’s all they can get. But remember: you’re the grownup. You need to know how to handle this child’s play better than they do. You will be amazed at the answer to that question. Just hang in there and TALK to them. It’s all your child wants. You might even end up snuggling instead of fighting. It’s not my job to get kids to like me. It’s my job to protect them, feed them, let them explore, and teach them how to be healthy physically and mentally. I have plenty of adult friends, I don’t need two-year-old friends. So I’m the bad guy sometimes. Kids know all this instinctively. They don’t really want to be my friend either – I’m boring. I like to sit around talking, not climb trees and have tea parties. I give them the boundaries they need and crave in a gentle but firm way. I don’t freak out when they do things that every child does just to see how I’ll react. When they get this calm consistency from me, they know they can trust me. And then they love me. And I love them, from the moment they start kicking and screaming, to the moment they come back and give me unconditional hugs and love. I took this amazing video of one of my babies a few weeks ago, but sadly I can’t post it here. I was hoping to but I’d have to pay WordPress $60 for the option. I haven’t bought myself new work shoes in over a year. The video option ain’t happenin. So picture if you will: a nine-month-old baby sitting on the 4′ X 5′ patch of wooden floor between the playroom and livingroom. He has a plastic pot from the cooking set and he’s bouncing it around on the floor. It’s spinning and rolling around, making a cool popping noise. The edge of the carpet in each room delineates this perfect play space, because when the pot hits either rug, it stays close. Every time it stops moving he scoots over to grab it. He throws it again and the cycle begins anew (except when he takes occasional breaks to chew on it). He does this for about half an hour every day, I’m not kidding. He’s totally focused, not paying attention to or even interested in whatever chaos is going on around him. He’s just totally zeroed in on that pot. It’s very zen, to be honest. I love watching him do it. As I watched him I realized he was hitting about a dozen learning targets in just this simple action. He’s getting hand-eye coordination, learning to recognize sounds, working on both small and large motor skills. He’s entertaining himself – not only is that a small miracle for a nine-month old, but that’s what you call self-directed learning. About a week after he started doing this, he was crawling. Can you imagine? All the amazing things going on in his brain during those quiet moments, all the growth he’s experiencing with this “child’s play.” To the casual observer it would seem like nothing, but I guess it’s true what they say – play is children’s work. And how can I quantify this on a report? If I write “Mr. W played with a cup for half an hour” I’d look totally negligent. Yeah, I left some trash on the floor and when he found it he had something to play with… As my husband would say, here come the people with the clipboards. But any smart grownup knows the box is the best part of the new toy.